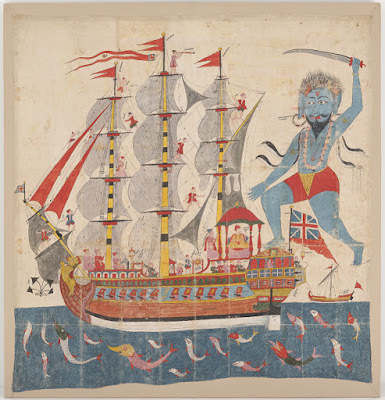 "Giant Demon Attacks a Ship," artist unknown, c1775, Freer Sackler Gallery. Special thanks to William Knight for bringing this to my attention! Popular tales and lively images played a role in transmitting beliefs and values to the Jain community. The Shripalarasa is a narrative that recounts the wondrous adventures of the Jain Prince Shripala, who travels to distant lands in search of trade and wealth. In this unusually large and vivacious painting, the artist represents the Prince's ship as a British vessel. The inscriptions scattered across the painting, which repetively [sic] identify parts of the ship, indicate a fascination with seafaring. The depiction of the Union Jack lends immediacy to a story that took place long before the British came to India. The artist of this painting is using a British vessel (the Indiaman) to put a modern twist on an old tale, but the Indiaman is the only nod to British seapower. The men on deck are clad entirely in the clothes of India. Given that, I will not be adding the usual tags to this piece, as it does not advance our knowledge of the dress of common British sailors. A few characters here and there have a passing similarity to British sailors, but it is likely that the artist is trying to evoke a tale that Indians can relate to, rather than a factual depiction of British sailors. A pair of hearty tars stand atop a spritsail yard. 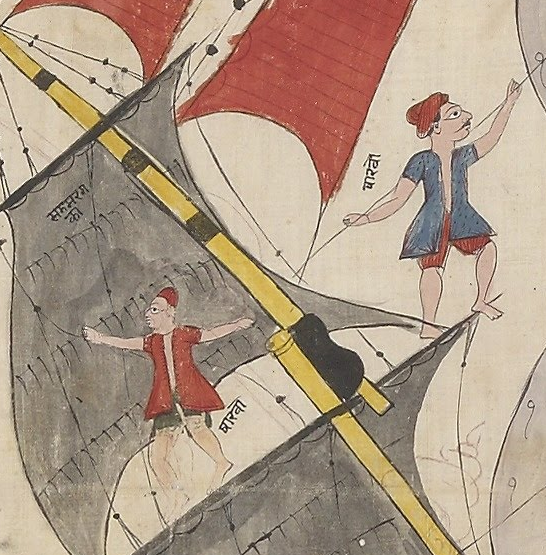 On the right is a man clutching a forestay who appears to be an Indian sailor. His long eyes and dark mustache lead me to believe this. British sailors were clean shaven, as with the blonde man on the left with the less angular eyes. Both men wear red caps with jackets that end above the mid thigh. Both are without waistcoat or shirt beneath. Notably, if the man on the left is indeed European, this is the first image I have seen of a British sailor not wearing shoes aboard a ship. 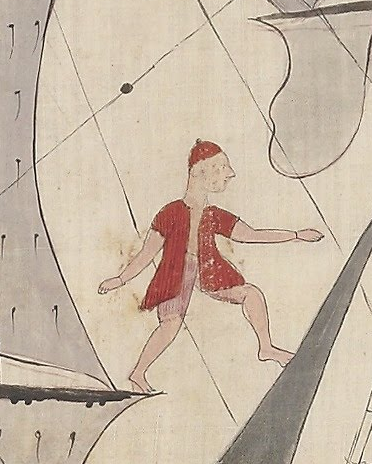 Much like his shipmates, this man wears a red cap, long jacket, and tight fitting breeches. As with all the figures in this piece, he is not clothed as a British sailor, but as an Indian sailor.